Whether you’re concerned about your skin, aching to rid yourself of dietary distress or looking to lose weight, chances are you’ve considered going gluten free. Those who have been prescribed a gluten-free diet by their doctors will tell you that it can be life-changing and the results are rewarding. Here are 7 simple steps for taking the leap to a gluten free lifestyle. Get a Fresh Start: Generally speaking, the food around the perimeter of the supermarket is a safe place to begin, so begin filling your grocery cart there. Fresh, non-marinated meats, poultry and seafood as well as raw veggies and fruits are naturally gluten free. Check out farmer’s markets for the best picks of the season. Fresh nuts and seeds are also naturally gluten free, but make sure packaging indicates that they were packaged in a gluten free environment. Clean the Cupboards: Take inventory of your pantry and unload items like crackers, cookies and other packaged goods that are not marked “Gluten Free”. Unopened boxes and cans can be donated to food banks as long as they’re within their expiration dates. Before refilling, wipe down cabinets to remove traces of gluten from the environment. For those with conditions like Celiacs, even the smallest amount of gluten can trigger a serious reaction. Know Your Sources: Buy prepared food from reliable sources that clearly print allergen statements, ingredient lists and nutritional facts. Research products that call out “naturally gluten free” on the front of their packaging. Check if they’re prepared in a gluten free environment, and if it says “manufactured in an environment with wheat, flour or gluten” leave it at the grocery store. Companies like Pamela’s Products, Cup 4 Cup and Dr. Lucy’s create products specifically for GF dieters. They understand the intricacies of gluten free production and run less risk. Scratch That Recipe: No, no, no, don’t give up cooking. In fact, gluten free eaters have even more options when they get in the kitchen and start from scratch. Learn to prepare your own stocks, sauces, marinades and dressing and your meals will be marvelous and completely under your control. Bloggers like G-Free Foodie, Gluten Free Goddess, and, for those on a budget, Gluten Free on a Shoestring, will help get your creative juices flowing. Put Everything in Place: If your whole household is not jumping on the GF bandwagon with you, it’s important to keep your ingredients in their own cupboard. Foods like peanut butter can get contaminated with gluten simply by double dipping the spreading knife after preparing your kids’ PB&J. Label your foods clearly and stock them separately from non-GF items to avoid these issues. Swap Smart: Don’t spend your time jonesing for a jelly doughnut. Instead, find foods that you love that fit within your new diet. 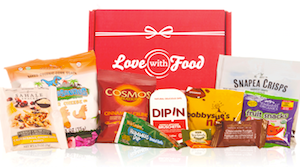 Chances are, you’ll come up with fabulous favorites that add a different dimension to your daily intake. 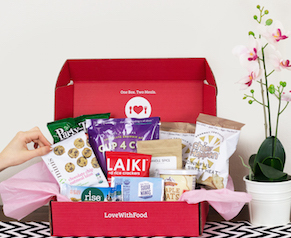 With Love With Food’s Gluten Free Snack Subscription Box curated by G-Free Foodie, we can assure you that you won’t miss out on a thing. Don’t Give Up on All Grains: While wheat no longer works for you, there are plenty of options left in the whole grain world. Protein packed quinoa, sweet cornmeal and hearty brown rice are great alternatives that you can find in most grocery stores these days. Have you tried going gluten-free? Tell us about the challenges you faced and tips for overcoming them in the comments below.